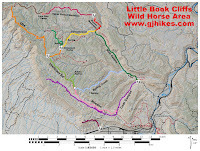 The YCC trail is located in the Little Book Cliffs Wild Horse Area near Grand Junction, Colorado. The trail begins on one end at Monument Rocks and ends on the other at Low Gap Camp. This post covers the first half of the YCC trail beginning at Monument Rocks. 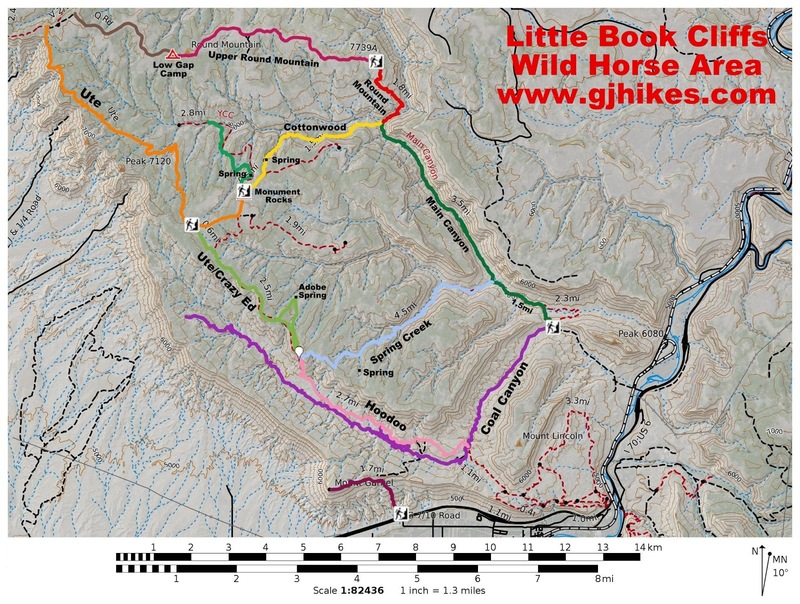 The YCC trail can be combined with the Cottonwood Canyon and Round Mountain trails to create a ~15 mile loop that would be suitable for backpackers and horseback riders. To get to the trailhead from Grand Junction requires driving through DeBeque. Follow the directions for the Cottonwood Canyon trail to get there. The Cottonwood Canyon and YCC trails both begin from the same point. The trail begins by following an old jeep road that leads past Monument Rocks. 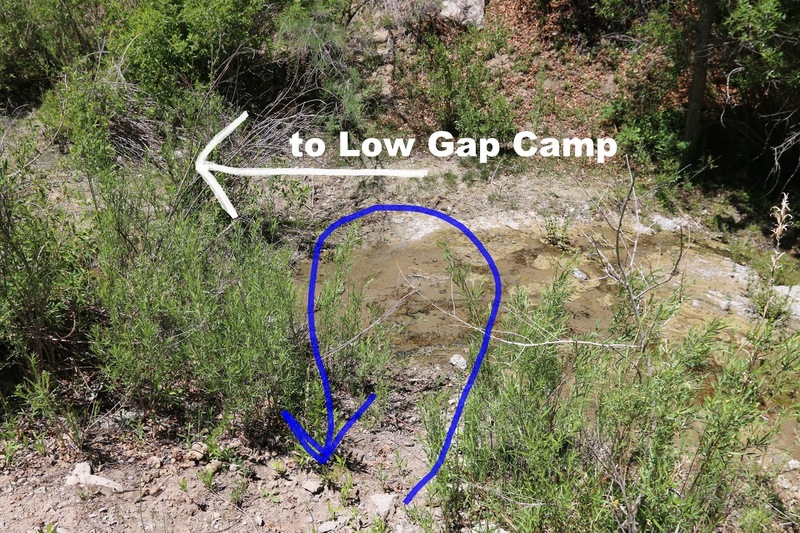 Besides the small campground just before reaching the trailhead there are a few primitive campsites in this area. The road ends and a singletrack begins at the Wilderness Study Area boundary near Monument Rocks Spring. Look straight ahead at the boundary sign to see a YCC trail marker on a tree to avoid the confusion from several side trails. Monument Rocks Spring is about 50 yards away in the downhill direction from where the marker is. If you go down to the spring return by the same route to pick up the trail that goes in the opposite direction. The YCC trail doesn't get an overabundance of use so it gets a little faint in places. There are a few trail markers but it is also good to keep an eye out for cut logs. The slideshow at the end of this post should give a pretty good idea of how the trail looks and what markers you can expect to see. After passing the spring the trail travels around the mountain laterally where it dips into the next drainage over. When the trail drops into the next drainage it crosses it and continues on the other side. There are very few trail markers from this point on at present to help with the route finding. This is another spot where looking for cut logs and tree branches is important. Many of the tree branches are cut higher up off the ground to allow passage for riders on horseback. The trail continues around to the head of Cottonwood Canyon where seeps in several alcoves create hanging gardens and feed the stream that trickles down to Jerry Creek. The trail that has been easy going up to this point gets steep and rocky as it descends into the canyon. The loose dirt and steep section only lasts for several hundred yards. For this post we turned around near the 2 mile point at the stream. From here the trail continues up the stream where it branches with one route that heads straight out to the Ute trail/access road and the other climbs out of the gulch and heads north to Low Gap Camp. We hiked the YCC trail after hiking the Cottonwood Canyon trail down to Main Canyon and back. Our plan is to come back at some time and hike the trail beginning at Low Gap Camp. Starting at Low Gap cuts off the worst part of the drive that goes between Indian Park and Monument Rocks. From what we saw of the trail we would recommend it only to hikers and backpackers with more advanced route finding skill. If you would like to see it for yourself then all you have to do is 'Take a hike'.